Written by poolpeeps on August 3, 2017 . Posted in Calvin's Tips. Here in Texas, we have some of the hardest natural water. Which simply means there are minerals in the water. The more minerals, the harder the water. Of course, Texas, due to the limestone, has very hard water. (Note: more than 1,000 ppm). I know you keep your pH in line, the alkalinity is where it should be, chlorine levels are dead on and you are diligent at the first sign of algae to add shock. I have no doubt you keep your water safe for people to swim in your pool. Safe for swimmers. But that doesn’t mean the water is balanced. There’s that crazy talk again. 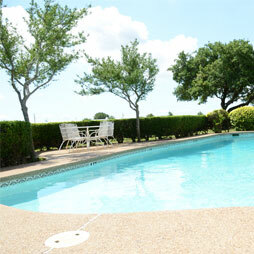 Just bear with me … Keeping water balanced means keeping the water harmless for your pool and the equipment. Water wants to have just the right amount of minerals to be happy (Note: Calcium carbonate). If there isn’t enough calcium in the water, it will attack the plaster and equipment to find it. That’s how pools become pitted and stain easily. If there is too much calcium you will see and feel scaling on the walls and floor of the pool, as well as in your pumps and heaters. Knowing your water is balanced saves you money. Lots of it. Now here is the crazy part – Pool Peeps will come out and do a Saturation Index for free! Just give us a call to set up an appointment.